Opening Day was a beautiful day. As is my tradition every year, Nancy Bea Cd played in the background while I got ready to go to Dodger Stadium. I drove to Union Station and hopped on the shuttle from there. My brother Vic and took the first shuttle at 9:45 AM. We got to Dodger Stadium at 10 AM. Game time was 1:10 PM. I heard of other people driving or taking the shuttle late and it took them an hour to get there from downtown. While waiting for the shuttle I heard about Vin Scully not being able to make it to the stadium. Get well Vin Scully! We Love you!! I had seen Vin Scully in San Diego and he looked good there but those colds cn sneak up on you. When I ran into him I told him “Good to see you Vin!” He looked back, smiled and said “Good to see you too!” I did not want to bother him so I did not ask for autograph or a picture. He responding to me was good enough for me. Back to Opening Day! I took out my brand new scorebook and started keeping score. One thing I don’t like about it, is it does not have the little squares to keep track of balls and strikes but I sneak them in there. My outfit for Opening Day was one that I wore in San Diego -The Magic Johnson yellow shirt with my #32 Sandy Koufax white jersey over it. They both wore #32. The only thing with the shirt is that is the same color as the Pirates. Picture from the LA Times. Nice man to my right with the grey Clayton Kershaw jersey. He liked that I was keeping score. He wrote the name of my blog. Dodger Stadium celebrating 50 years on its inagural day of April 10, 1962 had members of that year being honored. It would have been great for Vin Scully to introduce them as Opening Day has been the only day that Vin Scully addresses the crowd at the stadium. Pic by Jon SooHoo. Andre Ethier in his 30th birthday hit a homerun to right field! in the 8th. Kenley Jansen pitched the 8th and Javy in the 9th for the save! Did I say that I love this team? Pic byLa Times. Dodgers celebrating the win on Opening Day! Chad Billingsley pitched the second game. He had another great game and another win. Dodgers going for the sweep tonight 30% chance of rain with those chances increasing into the night BUT It can’t rain. It never rains in Calfiornia. haha. Just in case, I got my raincoat. Go Dodgers! Margie and Fam, Lorena & Margie. Deuce & I enjoying a lemonade! We love running into our Dodger friends. Here is Dee, Deuce and William. 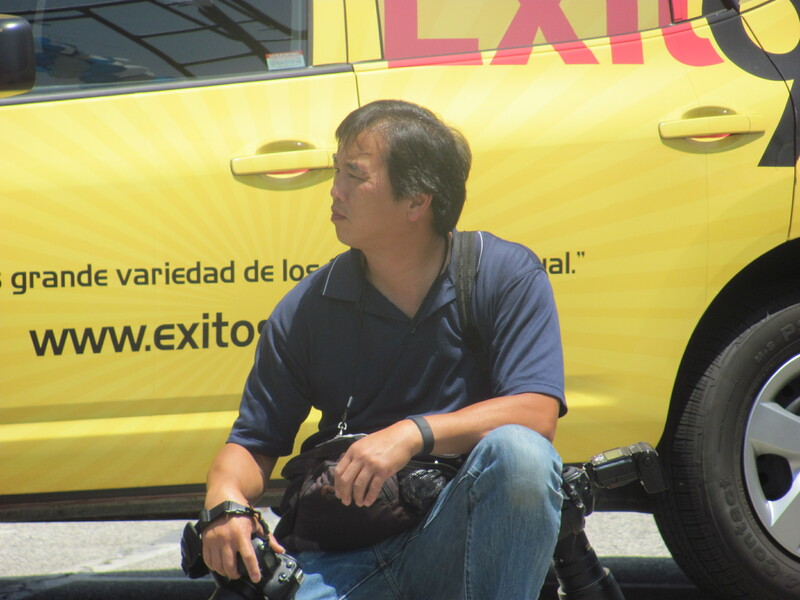 Also Jon SooHoo. and we love our boys in Blue. Here is Andre Ethier, James Loney and Matt Kemp. These pics taken by Elisa. When Lorena and I found out that there was going to be a Spring Traning Fanfest 3/3/12, we said “Let’s go!” Rosie, who we met on Twitter last year said “I want to go!” The original plan was to go for the day. We already had a Spring Training road trip planned for the St Patrick weekend so we thought a turnaround trip would be OK.
On Saturday 2/25 I get a text from Lorena that Amanda was joining. A few days later Lorena tells us her friend Priscila is also joining us. Our group had grown to FIVE. After thinking it over, we thought the original plan was kinda crazy to drive from LA to AZ and come back the same night so we changed it stay Saturday night. The buz at Camelback Ranch the day before we were to leave was that Sandy Koufax was there! Dodger fans were giddy with excitment. Kershaw, Sandy Koufax and Don Mattingly. Picture taken by Jon SooHoo. Because of Sandy Koufax was at Camelback Ranch, our group grew to seven a few hours before we were scheduled to take off. Needless to say some of us hardly got any sleep or none at all. The minivan arrived at my house about 2 AM. A few minutes later Rosie was dropped off at my house. Because of a mixup, Rosie did not bring anything but her purse. She thought we had changed back to making the trip a turnaround trip. She wanted to stay but we said “There is a Target, close by…. ” So off we went six women and a men in a Blue Minivan. The second one was with Javy! Plenty of pictures were taking especially at Sattle Ranch where 3 of the group rode the mechanical bull but I’ll leave the pictures for another post or maybe I should check with the group if is OK to post. I had a wonderful time on this trip. Can’t wait to be back at Camelback Ranch for St Patrick weekend. The only thing is I won’t be able to watch the game on Sunday as I am scheduled to work in NH the following week so I am taking a flight at noon. I started this post on November 3rd and left it on draft but was so busy when I was in NH and when I got back to LA I was so tired with lots to do so here I am Sunday November 7th. Hey! at least we got an hour back (I still need to change all my clocks at home). My post started with “get better Sparky” then I was so sadden when I heard the news on twitter while I was still in NH. 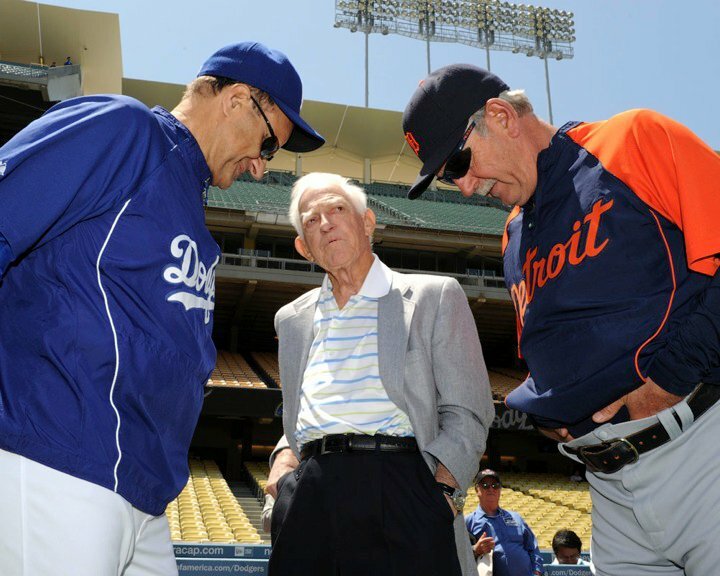 I remember this picture that Jon SooHoo of the Dodgers took back in May when Sparky made an appearance at Dodger Stadium when the Tigers were in town. My original post had a happy Birthday to Bob Feller. Happy belated Mr. Feller. Bob Feller turned 92 years young today last Wednesday. I still regret that I did not get his autograph when he was at the FanFest this year. Wasn’t he a cutie? Several years back (Has it been that long?) I enjoyed reading Sandy Koufax: “A Lefty Legacy” by Jane Leavy. When I saw the book about Mickey Mantle is by Jane Leavy, I immediately thought that it should be a good read. I also thought of Jane Heller . Currently I am reading Eat Pray Love by Elizabeth Gilbert. A friend at work in NH brought a bag a books to donate to the bookcase of books that is kept in the cafeteria so I picked that book. I am only 40 pages into the book, but I don’t think I want to see the movie. It just doesn’t seem to be a book that would translate well into a movie but maybe it will be worth it just to see Javier Bardem. 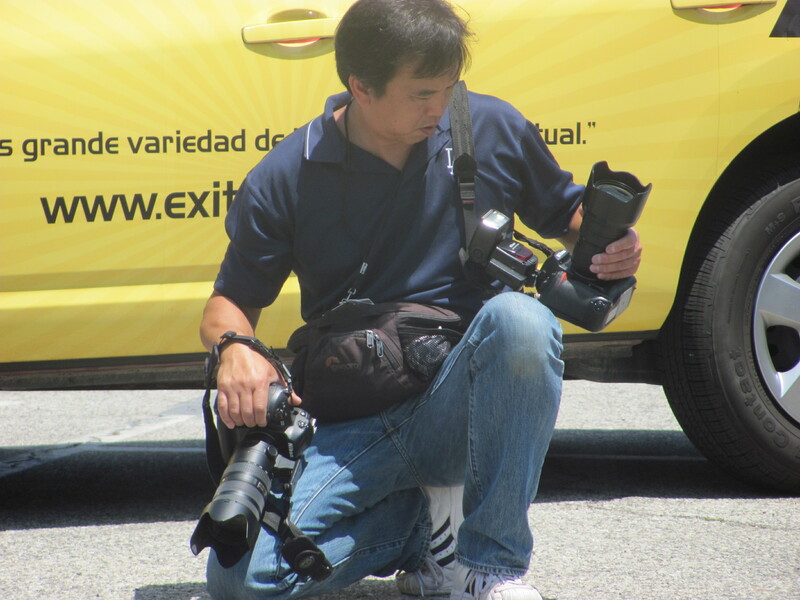 Dodger team photographer Jon SooHoo will be honored at Dodger Stadium for his 25th year with the Dodgers. He will throw out the first pitch! Checkout this picture from Jon that he took of Podsednik catching a foul ball. What does Randy Johnson and Jon SooHoo have in common? 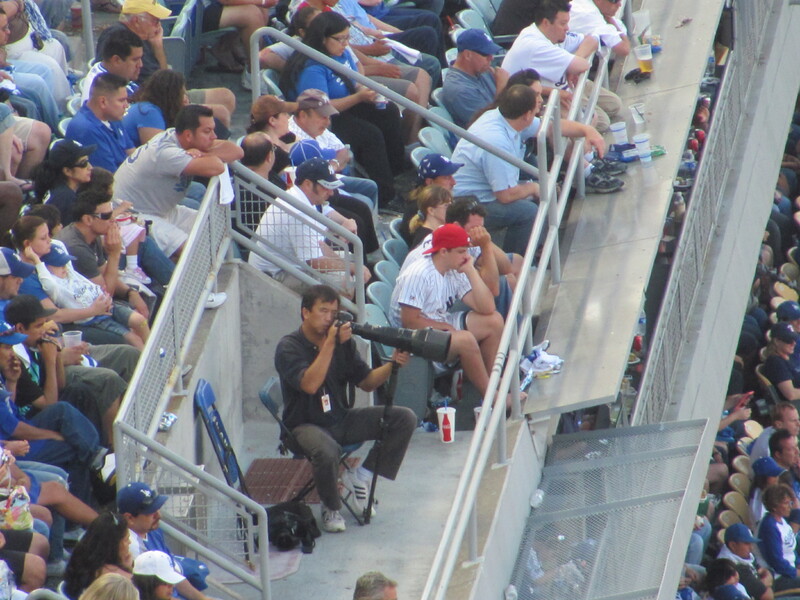 Believe it or not, Randy (Johnson) was actually part of the Daily Trojan photography department back in his college days and he reported to none other than Jon SooHoo, now the Dodgers’ team photographer. I have taken a couple of pictures of Jon. This was during Viva Los Dodgers where Jose Lima was honored. Here’s Jon checking his camera. Here is Jon again probably scanning the crowd for a good picture. I took this picture from the Top Deck when I spotted Jon in the Reserved section. Congratulations Jon! Throw a strike Jon and for a change we’ll take pictures of you! (talking to myself) where is the other picture I took of Jon?. hmmm.